Most of the readers are already acquainted with several Scandinavian brands and their jackets, either by having read, heard or even tried the jackets themselves. It’s no news that these brands are some of the best out there, especially when it comes to winter gear. This might be related to the fact that they know quite well what a truly harsh weather is. The brands selected for this article are eight. They are popular and renowned for the high quality of their designs. As for style, the jackets for this selection are definitive eye-catchers, with different styles and lots of colors, because it is important to remain in style and looking good even when the rain will not stop. The jackets are for both men and women, with unisex selections as well, so let’s head right into it. The first jacket comes from Ilse Jacobsen, a Danish brand, established in 1993 by Ilse Jacobsen. This brand is a privately owned company, mostly known for their shoes, but not falling behind in their accessories and clothes. This brand’s aspiration is to create beautiful and feminine designs, that will fit comfortably and last for a long time. The jacket of the selection is a rain mantel, that is made of 65% Polyester and 35% Cotton. It comes with oversized sleeves, with the cuffs extending beyond the wrists. It comes with a high collar that buttons up, as does the jacket, and with an adjustable hood. The length goes just above the knees and there are two side pockets. This jacket comes with a rain hat as well. The color selection includes: Navy, Orange, Yellow, Green, Red and Pink. Official website. 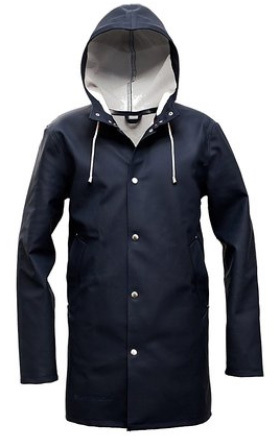 This next rain mantel jacket is by Alexander Stutterheim, the owner of the Stutterheim raincoats brand. 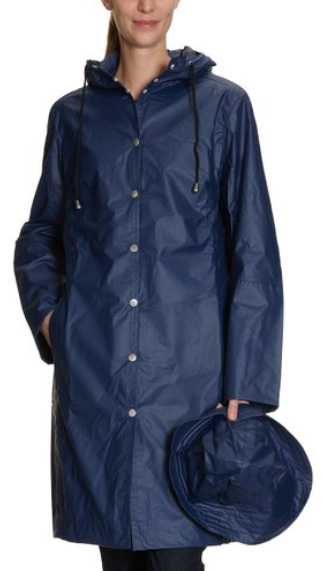 This brand is Swedish and was founded in 2010, with the intent of creating good quality raincoats, that not only keep you dry, but also look stylish. This jacket is unisex and it comes in the color Navy. It is made of 70% Cotton and 30% Polyester. It buttons up with snap buttons, all the way to the collar, which comes with an attached hood with adjusting cords. The sleeves are oversized and it is a long jacket. Official website. Tretorn is a Swedish brand, founded in 1891 by Henry Dunker, in Helsingborg. It began as a rubber shoe production company and it expanded over the years, bringing us to today, where they produce outdoor clothes, apart from their quality shoes and also tennis balls. The jacket we have selected is called Erna and it is a women’s jacket. The outer part is made of 80% Polyester and 20% PU, whereas the inner lining is made of 65% Cotton and 35% Polyester. There are two flap pockets on the sides and an inner pocket. The sleeves are oversized, with elastic cuffs that come with thumbholes as well as snap flaps for adjustment. The collar is in medium height and there is also an adjustable hood. 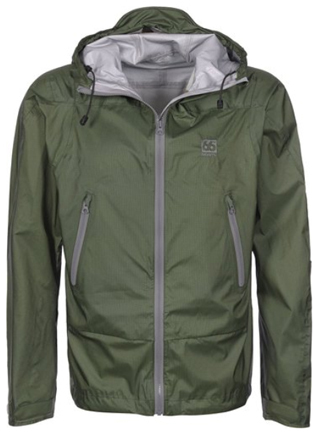 This jacket comes with a water resistance column of 8000 mm and it is also windproof. The main zipper is two ways and there is a zipper cover on top, with snap buttons. The colors available include: White, Black, Yellow, Fuchsia and Navy blue. Official website. 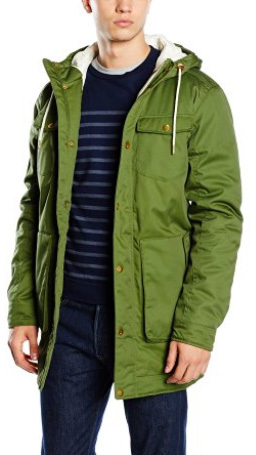 On to a winter coat, this comes from Tiger of Sweden. This brand was founded in Sweden, in 1903 by Markus Schwarmann and Hjalmar Nordström. It is known for their shoes, clothes and spectacles. They aim for trendy designs, while maintaining elegance in the look of their jackets. 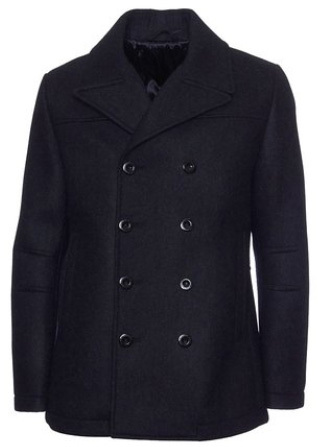 This coat is made of 46% Polyester, 41% Cotton, 10% PU and 3% Nylon, with a 100% Viscose material lining. It comes with double button closure to the front and a very classic look for the collar, resembling a tuxedo jacket. It is a very elegant coat, that goes well with a formal look and it comes in the color Grey. Official website. WeSC is the next brand in our selection. It is a Swedish brand, founded in 1999 and influenced by skateboarding and snowboarding. This jacket is for men and it comes in a casual style, but depending on the color, it goes great with most outfits, even those that are a bit more formal. The material is 65% Polyester and 35% Cotton. It comes with a zipper that begins at hip level and goes all the way up to the high collar. There is a flap covering the zipper, which closes with snap buttons. There are snap buttons on the collar and hood as well. This jacket comes with two oversized side pockets and two chest pockets with a snap button flap, for the Palm Green color and with two side pockets and one zipper pocket on the chest for the colors Black and Blue Iris. It is a long jacket, with high resistance against weather conditions. Official website. Fjällräven is a brand that we have featured before in one of our reviews. It was founded about 50 years ago, in 1960, in Sweden. It specializes in outdoor clothing and equipment and it is one of the most renowned brands by those who enjoy winter sports and especially hiking and camping. 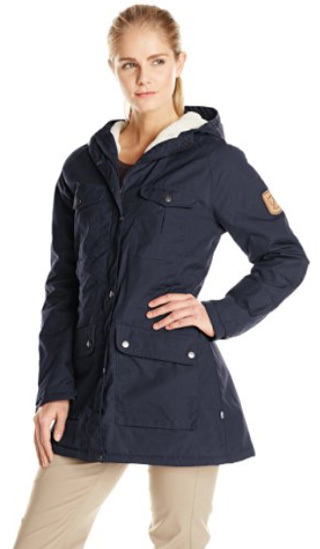 The Greenland Parka for women is a heavy winter jacket that comes in too many colors. The material is 65% Polyester and 35% Cotton, with an inner lining made of Polyester. The fabric used is G-1000, a versatile fabric created by the brand itself. It is highly resistant to weather conditions, UV rays, highly breathable and very durable. The jacket comes with two large side pockets and two chest pockets, and two inner pockets. The collar is high, once fully zipped and there is also an adjustable hood. The color selection includes: Dark Navy, Black, Red, Blue, Olive, Autumn leaf, Anthracite and many more. Official website. Haglöfs is another previously featured Swedish brand, founded in 1914 by Wiktor Haglöf. It markets over 500 products, focused in hardware, clothing and footwear, making it the largest supplier of outdoor gear in Scandinavia. 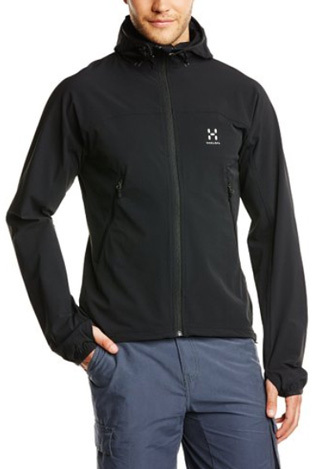 The Boa softshell jacket is made of 90% Nylon and 10% Spandex, making it lightweight and comfortable to wear. It is a jacket that can be worn for sports, outdoor activities or even as a daily jacket. It comes with a tucked in hood, and closes with a full-length zipper. The outer part has been treated with DWR and it comes with a wind flap and chin guard. The colors available are: Black, Nori green, Lime green, Cayenne, Danger, Azure blue, Storm blue, True black and Strato blue. Official website. 66°NORTH is the last brand featured in this selection. 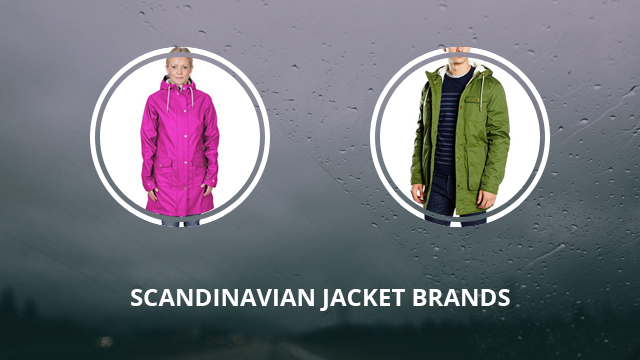 It was founded in 1926 in Iceland and it creates outdoor clothing for both sea and land. In the more recent years, the brand has designed sports clothing as well, earning a place among the most renowned outdoor clothing manufacturers. The jacket Skàlafell is quite versatile as it can withstand low temperatures, but due to its high breathability (30.000 g/m²/24h), it fares quite well in warmer weather as well. There are ventilation areas, Velcro adjustable cuffs and an attached hood. It comes with two side pockets located in the middle line of the jacket and the design is minimalistic, with only the brand’s logo on the upper left chest. The material is a combination of 50% Nylon, 33% PU and 17% Polyethylene. This is a great outdoors jacket, waterproof (20.000 mm H2O) and windproof, that you can wear anywhere, especially if you are a fan of outdoor activities. The colors available are: Black and Olive. Official website.